I tell you, packing for space travel is a lot of work. You need a spacecraft, breathing apparatus, a lifetime supply of Tang and astronaut ice cream, and now it seems having a third eye would be handy, too. Back in April, researchers Andrew Hamilton and Gavin Polhemus of the University of Colorado, built a computer model to simulate what entering a black hole would look like. However, the simulation only works so far. Hamilton and Polhemus realized that once you’re inside the black hole you’d no longer be able to judge distances because of our pesky binocular vision. With two eyes, we’re able to see the same object from slightly different angles. Combining those angles allows us to triangulate the object’s distance. In a black hole, where space is so strongly curved, everything gets messed up. At least, until you get a third eye. Hamilton speculates that having a third eye would allow you to compensate for the gravitational distortion and you’d be able to see. Until you get destroyed in the singularity, that is. Over the years, I have compiled a mental list of historical figures I would love to meet. Most of them are average people. Some had large impacts on social and cultural lifestyles. A few are ancestors. Only one was a political leader, and none were presidents. Recently I came across a series of portraits in the Local History Archive and decided I must add William Clifford “Cliff” Brollier to this list. Brollier may not have been a prominent Fort Collins figure, but he knew how to have fun. 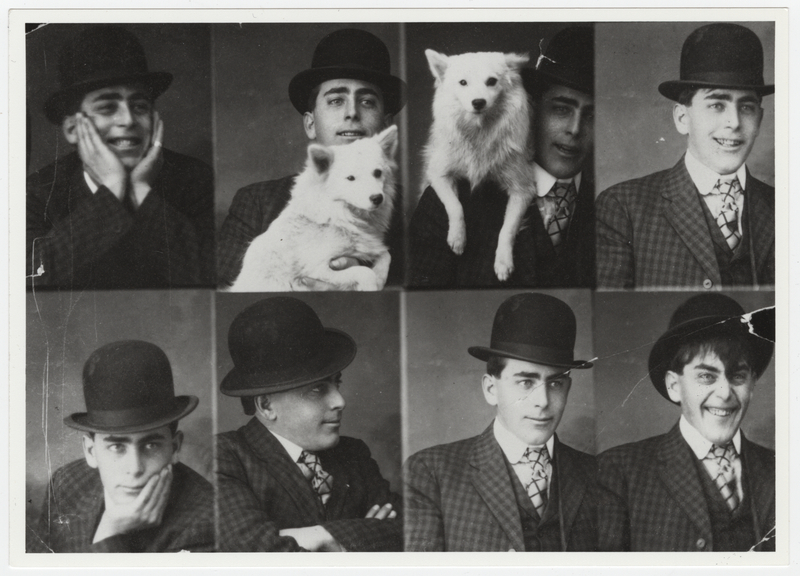 From the suave gentleman (bottom left), to the goofy joker (bottom right) to the casual dog-friendly man (top middle right), Brollier looks like quite a character. These portraits, taken around 1907, were donated to the Local History Archive by Brollier’s daughter Doris Greenacre. She clarified that the dog did not belong to him and said these were just some fun pictures he had taken. As I dug through the archive, I found a little more about Brollier’s life. According to census records and city directories, he was a bookkeeper for an oil company and lived at 307 Mathews St. with his wife and two daughters. 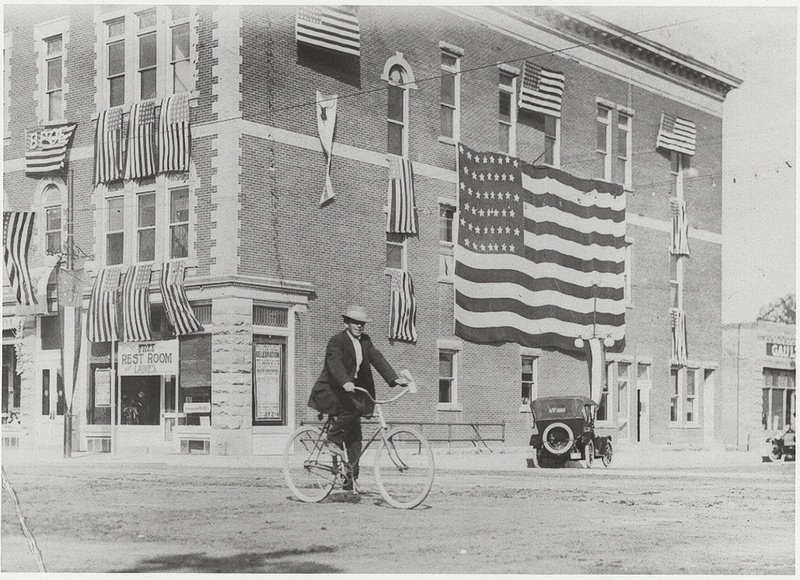 Another photograph in the archive of Brollier shows him on a bicycle in front of the old Elks building at the corner of Linden Street and Walnut Street. As you might guess from the plethora of flags, this shot was captured during a 4th of July celebration circa 1913. Even on the bike, Brollier has a smirk on his face for the cameraman. From these photos, Cliff Brollier looks like an interesting fellow; I have added him to my list of historical figures I would like to meet. Who’s on your list? I’m setting my alarm clock for 5:00 a.m. tomorrow morning. I don’t know if I’ll actually be able to get up (as I’m still a firm believer that there’s only one 5:00 in the day, and it comes just before dinner), but if I can, I’m in for a treat. So are many of you, if you’re better at being an early riser than I am. Early, early tomorrow morning, June 26, a partial lunar eclipse will happen when the moon passes through the southern portion of the Earth’s shadow. The best place to see this eclipse will be in the middle of the Pacific ocean. Sadly, Africa, parts of Europe, and even the eastern edge of New England won’t see anything, but out here in Colorado we’ll be able to see a “bite” taken out of the moon as the moon is setting at the end of the night. The moon will slide into partial eclipse at 4:17 a.m. MST, and will be deepest in shadow at 5:39 a.m. MST as the moon sets in the southwest and the sun begins to rise. It’s sure to be a pretty sight – a partially eclipsed moon in the predawn twilight. A bit of trivia for you: Lunar eclipses can only happen when the sun, Earth, and moon are aligned very closely. Hence, there’s always a full moon (when the moon is closest to the Earth) when there’s a lunar eclipse. The next full lunar eclipse will happen on December 21, 2010. 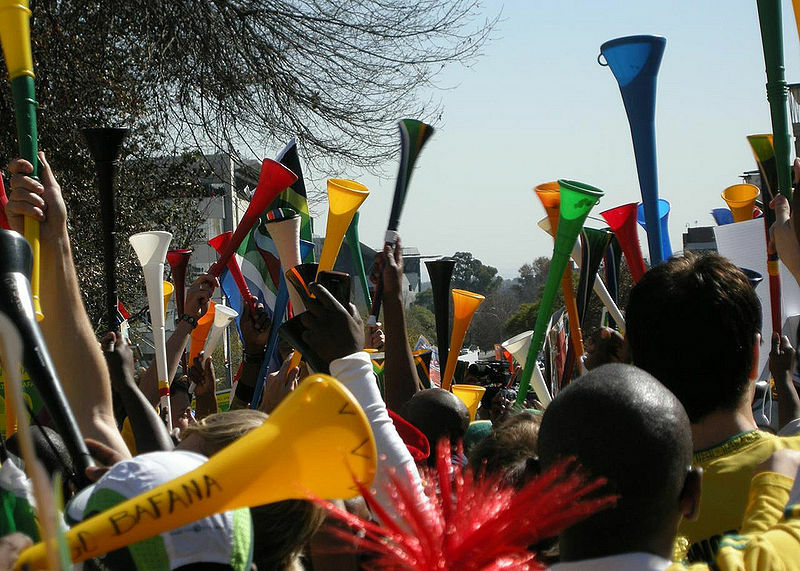 The vuvuzela has an interesting history tied to the South African Shembe Church. Introduced by the prophet Isiah Shembe in 1910, the vuvuzela has been used in religious ceremonies for the past one hundred years. Similar to the kudu horn (made from the horn of a kudu antelope, of course) the vuvuzela was originally created from cane wood. When used properly, the horn is believed to produce miracles including the healing of the ill and injured. One may ask, “If the vuvuzela can work wonders in the church, then why not on the football pitch?” Many members of the Shembe Church would carry their horns to the football matches that often followed their morning services. Some would compose songs for the vuvuzela to cheer on their favorite team. By the late 1980s, the elongated horns had become a regular sight at many matches throughout South Africa. The ubiquitous plastic versions, frequently seen and constantly heard during World Cup matches, wouldn’t be introduced until the 90s when Neil van Schalkwyk began to manufacture the horns commercially. The sound of the vuvuzela is produced by blowing a “raspberry” into the mouthpiece of the flared instrument. This causes the lips to open and close more than 200 times a second, setting up resonance within the horn. Producing sound at a frequency of roughly 235 hertz, the shape of the horn can set up harmonics ranging from 470 to 1630 hertz. In the hands of a trained musician, the vuvuzela can produce pleasing tones much like a trumpet. Several thousand sports fans blowing into cheaply produced plastic versions of the horn can, on the other hand, sound like a swarm of slightly inebriated bees. This is where the problem lays. Our hearing is a form of warning system that alerts us to potential danger. Constant sound may simply fall into the background as our brains process it as harmless white noise. 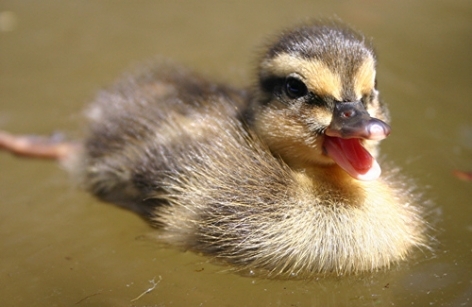 Sudden changes in sound, however, may indicate danger and keep us more alert. The variations at which a large crowd of vuvuzela tooting football fans may be playing creates a constant shift in the sound, or droning, that makes us very aware of its presence. In the absence of any immediate danger, this sound becomes merely annoying. Of course, the vuvuzela may present a danger itself. (No, I’m not talking about what you’d like to do to Mr. van Schalkwyk for introducing the instrument to the masses.) The danger comes in the sound levels produced by just one vuvuzela, let alone thousands playing in unison. Flared instruments, such as trumpets or saxophones, produce much louder notes than their straighter brethren the clarinet. The vuvuzela is capable of reaching 116 decibels at one meter, much louder than is recommended for extended exposure. Audience members tested directly after a match have shown signs of temporary hearing loss. If you plan on attending a live match during World Cup, I recommend some form of hearing protection. If you’re trying to enjoy the match from home, there are a few measures you can take to increase your enjoyment and decrease your desire to stick your fingers in your ears and make “lalalala, I can’t hear you!” noises. First, check your television to see if you can adjust the audio. Turning down the treble may work wonders in dampening a good portion of the drone. If you have a surround sound system, turning down the left and right speakers will eliminate most of the crowd noise while the game announcers will likely be directed through the center speaker. The internet is also offering a variety of solutions including MP3 files of white-noise designed to cancel out the vuvuzela , and programs intended to filter out the range in which the “buzzing” occurs. Be careful in what you try, as some of the internet remedies reportedly are more irritating than the situation they claim to fix. Kickin’ it Old School; or, Yes, but does it come in black? This story has it all; history, science, footwear. A team of archaeologists have found a leather shoe dating back to 5,500 years ago, while working in an Armenian cave at an elevation of 10,000 feet. The cool, dry conditions of the cave, described as being lined with sheep dung, created an almost perfect environment to preserve the leather material. The cave has proven to be a warehouse of discovery and the team has catalogued a variety of other well-preserved artifacts including a broken pot and sheep horns – that dung had to come from someplace. They’ve also come across a variety of containers holding dried apricots and barley. 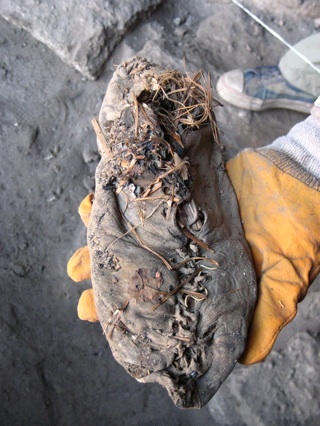 So well-preserved was this shoe specimen that the scientists have been able to determine that the maker used vegetable-based oil in the tanning process. While DNA analysis has not been viable with the leather sample, a close examination of the material’s pores indicates that the leather most likely came from a cow. The style of the shoe has been compared to “Pampooties,” a lace-up bootie worn in the Aran Islands off the coast of Ireland until the 1950s. Similarities to footwear found throughout Europe indicate that this style was in wide use for thousands of years and suited to a variety of environments. This discovery predates the previous record holder for oldest leather shoe by a few hundred years. Found in 1991, the iceman known as Otzi to the general public (and “Frozen Fritz” to his close friends) sported a pair of leather shoes that dated back roughly 5,300 years. Of course, the oldest shoes currently known were more akin to socks; woven out of grass and wrapped in leather thongs made from deer and bear hide. What they may have lacked in style, they made up for in originality — dating back to more than 7,400 years before present. These were discovered in Arnold Research Cave, located in Callaway County in mid-Missouri. Editor’s note: I was startled as I read Toby’s post to find Arnold Research Cave (ARC) invoked — as an anthropology undergrad at the University of Missouri, I did my archaeology field school at ARC in the summer of 1981. The shoes found at ARC were uncovered by a previous expedition; we were on the lookout for more, but didn’t uncover any additional specimens during that summer. Nor did we have any idea how old those shoes would turn out to be — they weren’t definitively dated until the late 90s. Small world! 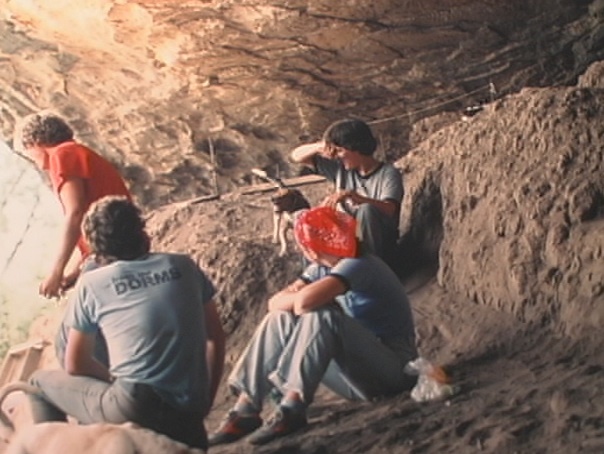 Digital Media Coordinator Terry Burton (back right) at Arnold Research Cave, 1981. Now that's old school!